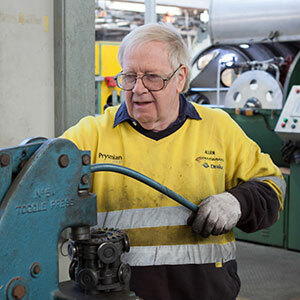 The success of a company is determined by the hard work and dedication its employees – and Prysmian is no exception to this. Each employee we have within in our company is integral in helping the company is to achieve its goals. A few weeks ago, we commended the commitment and hard work of Allen Webb, who this year celebrated 47 years of contribution to our company. On Monday 23 July, we opened a new meeting room on level one of the Admin Building in his name – the ‘Allen Webb Room’. We express our gratitude to Allen for his 47 years’ service, it is truly remarkable and sincerely appreciated – We wish him all the best in his retirement.